The book features complete details on all exam objectives, 250+ practice questions, step-by-step exercises, on-the-job elements, a two-minute drill at the end of each chapter that reviews the key points in the chapter, and chapter self-tests. The CD contains MasterExam practice exam software with all new questions, a Searchable electronic book, and a second practice exam (with free online registration). 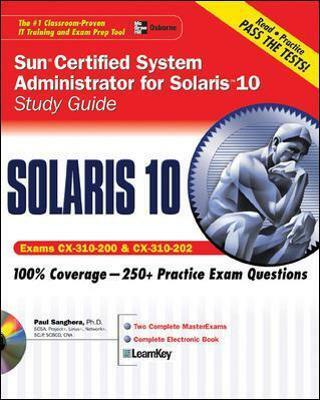 Primarily Written for those who want to earn the Sun Certified System Administrator (SCSA) certification for Solaris 10, this guide presents full coverage of the official objectives for both the required exams: CX-310-200 and CX-310-202. In spite of the laser sharp focus on the exam objectives, this is not a cram style book. Written in a classroom-based teaching style, this book presents material in a sequential fashion: topics and chapters build upon the previously covered topics and chapters. There is no hopping from topic to topic. An introductory chapter for beginners and a cohesive, concise, yet comprehensive presentation of the material makes it a self contained book that requires no prior experience in Solaris or UNIX. Even after passing the exam, you will find yourself coming back to use this book as an on-the-job reference.Full coverage of exam topics includes:Basic and advanced Solaris 10 installationManaging file systems and core dumpsPerforming user and security administrationManaging network printers and system processesPerforming system backups and restores and managing storage volumesManaging naming servicesManaging role based access control and system messagingUnderstanding fundamentals of TCP/IP networking and managing network servicesThe book features complete details on all exam objectives, 250+ practice questions, step-by-step exercises, on-the-job elements, a two-minute drill at the end of each chapter that reviews the key points in the chapter, and chapter self-tests. The CD contains MasterExam practice exam software with all new questions, a Searchable electronic book, and a second practice exam (with free online registration).